Our team of educators will visit your classroom, or meet you on location at one of our outdoor learning spaces, to present one of our many experiential, environmental education workshops. If you are wondering what workshop connects with what curriculum outcome please check out our 2017 curriculum tool. For program details and pricing check out our K – 8 Environmental Education Program brochure. This program is available for grade 3 to 7 classes from Langley or Surrey in either the spring or the fall. For six weeks (alternate weeks in the spring, consecutive weeks in the fall) classes visit the Langley Demonstration Garden to learn where food comes from, how it grows from a seed, and how it gets to our plates. With hands-on activities outdoors, students explore plant biology, soil health, farming, pollination, and the food system as a whole. Healthy food and learning from the natural world are ongoing themes. Teachers wishing to use the Nature’s Classroom program with an existing school garden can ask about having a portion of the sessions at their school, or are welcome to utilize the Nature’s Classroom curriculum themselves; it is available for free on our Resources page. Contact LEPS early to participate, as the program reaches capacity every year. Please note, we try to group grades 3-5 in the spring (after spring break to mid-June), and grades 5-7 in the fall (mid-September to end of October). EcoKits are a free environmental education resource provided by LEPS that can be adapted for any grade-level. The kits include information, activities and materials designed to make teaching and learning about environmental issues easier and more fun! EcoKits can be reserved through School District 35 Media Centre. Established through a donation from Township of Langley Councilor Mel Kositsky, the fund offers bursaries to students who have volunteered with LEPS and are interested in pursuing a career in the environment. 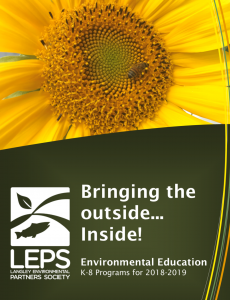 LEPS staff is available to assist teachers establish, plan and implement school environmental clubs. Two examples of successful environment clubs are the Shortreed Elementary EcoTigers and the Environmental Scientific Investigators of Parkside Elementary. Paint a drain to save a fish! Mark the storm drains around your school with yellow fish. This symbol reminds residents that ALL DRAINS LEAD TO FISH HABITAT. All materials can be borrowed from LEPS. $100 deposit required. Contact our Education Coordinator to book an environmental education workshop for your class.